Home / Resources / Highway History / General Highway History / Ask the Rambler / Interstates in Hawaii: ARE WE CRAZY??? Let's face it. "Interstate" means "existing between or including different States," so Interstates in Hawaii must be, if nothing else, a linguistic inconsistency. Why is it that people suddenly become linguists when it comes to Interstates in Hawaii? Okay, okay, here's the scoop. For the most part, the Interstate System is a connected network of highways bound by the Canadian and Mexican borders, the Gulf of Mexico, and the Atlantic and Pacific Oceans. However, Hawaii has several Interstate routes that are not connected to the rest of the System but are nevertheless part of it. Hawaii's Interstate routes were an outgrowth of the statehood movement that culminated on March 18, 1959, when President Dwight D. Eisenhower signed legislation making Hawaii a State. That same year, Section 105 of the Federal-Aid Highway Act of 1959 directed the Secretary of Commerce, where the U.S. Bureau of Public Roads (BPR) was located at the time, to study the need for Interstate routes in Alaska and Hawaii. After identifying possible routes, the BPR evaluated them according to the same criteria applied during a 1957 expansion of the Interstate System: national defense; system integration (the value of the route as a connector between centers of population and industry); service to industry, fishing, agriculture, mining, and forestry, as measured by the value of products or by traffic data; and population. On that basis, the BPR's January 1960 report to Congress recommended a 50-mile Interstate network in Hawaii (the report recommended against designating Interstate mileage in Alaska). The Hawaii Omnibus Act, which President Eisenhower signed on July 12, 1960, removed the limitation in Federal-aid highway law that the Interstate System be designated only within the "continental United States" and provided for the regular apportionment of Interstate Construction (IC) funds to the State. On August 29, 1960, the BPR designated three routes, identified as H-1, H-2, and H-3. Photo of Hawaii's designated three routes, Identified as H-1, H-2, and H-3. 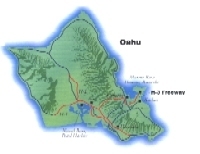 On November 1, 1989, the Federal Highway Administration approved the State's request for a fourth route a 4.1-mile section of Moanalua Freeway/State Route 78 that had been upgraded to Interstate standards without Interstate Construction funds. It was assigned the temporary number H-1-A, but was numbered H-201 on December 8, 1990. The Hawaii Department of Transportation initially chose not to display the number on the route, but has posted signs. The Rambler thinks the decision to designate Interstate routes in Hawaii may become clearer by adding that the Interstate System is more than just a series of connected highways. It is also a design concept, with highways designed to handle high volumes of traffic safely and efficiently at freeway speeds. Moreover, the Interstate System is not limited to routes passing through two or more States. Many Interstates, such as circumferentials/beltways and spurs, are confined to one State. 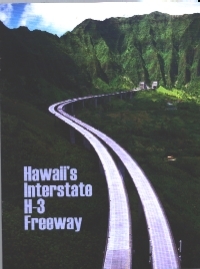 Although Hawaii's Interstate highways are not connected to those in the continental United States, they are built to Interstate standards. The fact that they carry an "H" number, rather than an "I" number differentiates them from the connected system of Interstate routes on the continental United States. UPDATE: The Hawaii Department of Transportation completed H-3 in 1997, with the dedication ceremony held on December 12, 1997. Controversy followed the highway from start to finish, but H-3 emerged as one the most beautiful segments of the Interstate System. The completion of H-3 in 1997, H-3 has emerged as one of the most beautiful segments of the Interstate System. The Rambler didn't want to mention it, but Alaska and Puerto Rico also have Interstate highways. Under Title 23, United States Code, Section 103, the BPR/FHWA designated four routes totaling 1,082 miles of Interstate highways in Alaska. Puerto Rico's three Interstate highways total 250 miles. Unlike the mileage in Hawaii, the mileage in Alaska and Puerto Rico is exempt from meeting Interstate design standards. Section 103 (c)(1)(B)(ii) states that these routes "shall be designed in accordance with such geometric and construction standards as are adequate for current and probable future traffic demands and the needs of the locality of the highway." Alaska's Interstate highways are designated A-1, A-2, A-3, and A-4, while Puerto Rico's routes are designated PRI-1, PRI-2, and PRI-3.